Jesus said in Matthew 5:7, “But let your ‘Yes’ be ‘Yes,’ and your ‘No,’ ‘No.’ For whatever is more than these is from the evil one.” This was telling Israel that they were not to swear, but to be people of integrity in what they said. This is essentially repeated by Paul for those in the church. James repeats it in his epistle as well. However, this really has nothing to do with making oaths or vows. The Old Testament explicitly speaks of making vows, such as in our passage today. As the New Testament doesn’t explicitly deal with either oaths or vows, we must use common sense in how we deal with them. In an oath or vow to another person, we are committing to perform based on our words, and in our circumstance of being Christians. Their perception of our integrity, and our allegiance to Christ, is at stake. If we make such a vow, we are to perform it. Secondly, in making a vow, we are doing so in the name of the Lord. To do so in any other name or capacity, such as “I vow on my mother’s grave…” is idolatry. Because we are vowing in the name of the Lord, we are expected to perform what we say. Having said this, if we made a vow which is contrary to our life in Christ, before coming to Christ, it cannot be something we are expected to perform. First, it is contrary to our commitment to Christ. It is not to be done. Secondly, we were in a completely different state before we came to Christ. If we made a vow which was inappropriate, the sin of that vow is forgiven in Him. However, not all vows are abrogated in coming to Christ. A vow of marriage between a man and a woman must stand. It is legal, it is appropriate under the New Covenant, and therefore we are bound to it. If a guy, however, made a vow of marriage to another guy (perish the thought), before coming to Christ, that vow cannot stand. It is illegitimate in the eyes of the Lord, and it must be ended in a legal fashion in the society in which we live. In other words, common sense needs to be used when considering vows which we made before coming to Christ. I think, probably, my friend and I would agree on the issue of vows up to this point. However, he mentioned to me one time, “What if someone made a stupid vow to never drink coke again. Would that be binding?” I would say, “Yes.” If you have vowed to the Lord that you will do, or not do something, then it is binding. He says, that is putting us back under the law. I say, it is submitting to our vow made to the Lord. At what point is our word to be taken as anything less than as we speak? If our Yes is to be Yes, and our No is to be No – even apart from vows – then how much more should our vows be held as sacred! If this is so; if sin is not being imputed to us, then one’s logic might be that, “I cannot be sinning if I break my stupid vow of not drinking coke again.” In this, there is the assumption that the non-imputation of sin means one is not doing wrong. That is a category mistake. One may not be imputed sin, but one can still do wrong. The non-imputation of sin means that we will not die. The wages of sin, after all, is death. What this means is that we will never again lose our salvation, because we are not imputed sin for our wrongdoing, and thus we will not die. We have been (past tense) granted eternal life, and that will not change. Sin is no longer imputed. But wrongdoing is still reckoned. This is what then falls under the category of rewards and loss. We will all stand before the Bema seat of Christ and receive our judgment for deeds done in the body, whether good or bad. To vow a stupid vow which one will break because it is stupid is wrongdoing. To vow a vow which will lead to one doing wrong is to then commit wrongdoing. Either way, wrong has been done. The sanctity of keeping vows is found in the books of wisdom – Psalms, Proverbs, Ecclesiastes, and Job. These cannot be regulated to merely a part of the Old Covenant. The books of wisdom speak of that which is right on a basic level. They speak of that which is fundamentally right – apart from the law. Let us be wise and circumspect both in making oaths and vows, and in performing them. In the end, sin will not be imputed to you for your failure to perform your vows, but you will be held accountable for failing to perform them nonetheless. Understanding this, it’s time that we get into our verses of the passage before us. It’s been a wonderful trip through this book, and we are almost at its end as we begin Chapter 27. Great things are to be found in His superior word. And so let’s turn to that precious word once again and… May God speak to us through His word today and may His glorious name ever be praised. The words here indicate that an entirely new section of instruction from the Lord lies ahead. It is the standard phrase to indicate this, and so these words are to be taken as a completely separate section within the book. Before closing out this marvelous book called Leviticus, the Lord has one more item to be included in it, and without this chapter, there would be a lack in the book’s content. The word “appendix” is used by many scholars to describe the contents of this chapter. This is for a few reasons. First, the final words of Chapter 26 appear to close out “the statutes and judgments and laws” which were made between the Lord and the children of Israel there at Sinai. Secondly, it is because this chapter deals with vows, and vows are a free-will expression by an individual who is under no obligation to make the vow in the first place. Thus, they lay outside the law. Although this is true, calling this chapter an appendix is not the best way to look at it. First, neder, or vows, are referred to five times in Leviticus. These are given in conjunction with the details of other temple sacrifices. The legal acknowledgment of these vows within the sacrificial laws thus requires that commands concerning them be carefully laid out. Secondly, the verses end acknowledging that the chapter details commandments given by the Lord while still at Mount Sinai. Thus, this is not an appendix. Here, the verb pala, or wonder, is translated as “consecrates.” The idea is that as a wonder, or miracle, is something out of the normal, so a vow is something out of the normal. It is above and beyond what is considered regular. Even today, when someone does something above and beyond, we will proclaim, “Well, isn’t that wonderful.” This carries the idea being conveyed. If that is the case, then why vow someone to the Lord? If the purpose is to redeem, then why vow at all? Why not just give the money to the priests? Secondly, the vowing of animals and land will be mentioned next, and they too could be redeemed, but it was not the expectation that they would be. What seems to be the case is that when a vow is made to consecrate a person to the Lord, that person belonged to the Lord permanently. Unless redeemed, they would be devoted to the service of the sanctuary for the duration of their lives. We might ask, “Why would someone do this?” But we do it in our own society, even if with different means, the intent would be the same. We give children up for adoption in hopes of them, or us, having a better life. We give ourselves up to employers, even signing work contracts, in order to secure a more positive future. Someone at the sanctuary would be under the care of the sanctuary. This practice may explain the term nethinim which is used in Chronicles, Ezra, and Nehemiah to describe a class of people who served at the temple, but who were of a lower class than that of the Levites. Nethinim comes from natan, to give, and thus they may be people given over to the temple service, whether those of foreign birth as slaves, or those of Israel who are consecrated by vow. The purpose of the valuation, then, would be to redeem a person who was devoted to the Lord if their future looked brighter outside the temple. If this was the case, then they could be redeemed to live out their lives as the Lord had prospered them apart from the temple service. Again, this is conjecture, but it makes logical sense. 3 if your valuation is of a male from twenty years old up to sixty years old, then your valuation shall be fifty shekels of silver, according to the shekel of the sanctuary. The valuations of the people to follow are based on ability to serve, and skill in service, not on intrinsic value of the person. Serving the Lord is what is being valued. In the case of a man between twenty and sixty, they are in the prime of life, and the expected service would be considerable. To redeem them then would require a large amount, fifty shekels. It is silver which is specified, and throughout Scripture, redemption is pictured in silver. Again, ability to serve, not intrinsic value of the person, is being seen here. Peter calls women the weaker vessel in his first epistle. The amount of physical productivity expected from a woman was a bit more than half of that for a comparable male. This was the value set for a male or a female slave who had been gored by an ox in Exodus 21:32. It was also the value the Lord was priced at when Judas betrayed Him to the chief priests. The value set here is less than half that set for those between twenty and sixty. This shows us that skill, knowledge, and ability are all factors which are considered. The age of twenty is when the congregation was considered acceptable for war, as Numbers repeatedly states. Before that, those nineteen and younger were still considered as not ready for the challenges of adult life. In this one category, the value of the female is exactly one half of the male, rather than 3/5, or 2/3 percent. This indicates that the service of females of this age is not considered to be of the same proportion as at other ages, probably because of the issues females especially face between these ages. A child of such an age would be almost a liability as one who is considered for service. The prospects would be of a future worker only, and thus the price is very small for redemption value. 7 and if from sixty years old and above, if it is a male, then your valuation shall be fifteen shekels, and for a female ten shekels. This verse contains the last use of the word muk, or poor, in the Bible. It signifies someone who has become thin; thus figuratively to be impoverished. Scholars point to this verse and say that this entire section on vows presupposes redemption of the individual, and this is a ceremonial rite, not an actual vow to service. Otherwise, the person would be obligated to service to the Lord. Paul is saying that the disposition of the individual is what makes an offering acceptable or not, regardless of the size of the gift. If one eagerly, and with a right heart, gives just thirty cents, they are doing well. However, if someone gives one million dollars with the wrong intent, why would they be credited with an acceptable gift? The world focuses on the size of the gift, but God focuses on the intent behind it. Understanding this, we can see that a gift is based on the heart of the giver and it is “according to what one has.” The poor man with little can still give a grand gift. It is accepted then “not according to what he does not have.” If it was, then only the gifts of the wealthy would be acceptable regardless of the amount given in comparison to the amount they possess. 9 ‘If it is an animal that men may bring as an offering to the Lord, all that anyone gives to the Lord shall be holy. These words now refer to any animal that was considered as an acceptable sacrifice to the Lord, as already detailed within the law – bulls, goats, rams, lambs, and so on. Any such animal that was brought to the Lord became holy. This means that it was henceforward set apart for sacred use – either for sacrifice on the altar, or for the maintenance of the priests and sanctuary. It could also be put with the animals intended for later sacrifice. 10 (con’t) and if he at all exchanges animal for animal, then both it and the one exchanged for it shall be holy. 12 and the priest shall set a value for it, whether it is good or bad; as you, the priest, value it, so it shall be. It is an obvious verse. The quality of the animal is set by the priest, and from that determination, a price is then set. 13 But if he wants at all to redeem it, then he must add one-fifth to your valuation. The animal’s price was set at a certain amount, and it is for that amount that it could be sold to another. But the one who brought it forward originally would have to pay 1/5 more for it than anyone else. This was intended to avoid people making rash vows. There would be a penalty imposed for having so dedicated and then decided to have again what was dedicated. 14 ‘And when a man dedicates his house to be holy to the Lord, then the priest shall set a value for it, whether it is good or bad; as the priest values it, so it shall stand. 15 If he who dedicated it wants to redeem his house, then he must add one-fifth of the money of your valuation to it, and it shall be his. The same penalty for the redemption of an unclean animal is found here. It would make no sense for the usual practice to be the redeeming of the property by the original owner. 16 ‘If a man dedicates to the Lord part of a field of his possession, then your valuation shall be according to the seed for it. A homer of barley seed shall be valued at fifty shekels of silver. This speaks of land of original inheritance. It belongs to the family and tribe forever, and so only the produce could be dedicated. The amount is set based either on how much barley seed the land would require to seed it, or how much the land was expected to produce, it is debated which is correct. Probably it is for sowing. After that though, then a set value of silver for that amount of seed was set. 17 If he dedicates his field from the Year of Jubilee, according to your valuation it shall stand. This would be land dedicated immediately after the Jubilee. In such a case, the full valuation applied. This then covered 49 years. 18 But if he dedicates his field after the Jubilee, then the priest shall reckon to him the money due according to the years that remain till the Year of Jubilee, and it shall be deducted from your valuation. This speaks of the years remaining until the next Jubilee. A standard calculation was to be made based on the number of years left, and then the amount of corresponding seed was then to be converted into silver, and that would be the set value. 19 And if he who dedicates the field ever wishes to redeem it, then he must add one-fifth of the money of your valuation to it, and it shall belong to him. Again, the same 1/5 penalty is imposed upon anyone who desired to receive back his vowed offering. It would be a lesson that would be remembered by the one who vowed and then reconsidered. 21 but the field, when it is released in the Jubilee, shall be holy to the Lord, as a devoted field; it shall be the possession of the priest. The intent of the man, with his landed inheritance, was that it would forever be the Lord’s. It would never return to the land of the tribe from which he came. We might think this odd, until we see what people do with land they once possessed, giving it to the state or county in which they live as a memorial park, arboretum, etc. It is taking the land out of the family’s possession, and it is taking it out of the possession of anyone else as well. Thus it becomes a testimony of love by the one who has parted with it. This would be landed property purchased by someone from its permanent owner as described in Chapter 25. The individual has actually not bought the land, but the crops of the land. 23 then the priest shall reckon to him the worth of your valuation, up to the Year of Jubilee, and he shall give your valuation on that day as a holy offering to the Lord. The priest was to then make an evaluation of the seed of the land which would occur till the year of Jubilee, and when that amount was set, the one vowing was to give the money to the priest for the care and maintenance of the sanctuary. But no 1/5 would be added to it as it was not his landed property to be redeemed, and so only the money of the vow would ever be exchanged. 24 In the Year of Jubilee the field shall return to him from whom it was bought, to the one who owned the land as a possession. As it wasn’t the buyer’s actual property, he had no right to sell it, or have it transferred out of the possession of the landed owner. Thus it went back to the landed owner at the Jubilee. 25 And all your valuations shall be according to the shekel of the sanctuary: twenty gerahs to the shekel. The shekel is defined as twenty gerahs. It comes from garar which means “to drag away.” The gerah literally means “a bean” or “a kernel” which is round as if scraped. Thus it is a portion of a shekel which has been taken away. This is the same idea as our use of “grain” when speaking of money, gun powder, etc. The reason for including this statement is to ensure that the sanctuary shekel, which was the standard, was to be used, and the silver was to be according to that 20-gerah standard. The number 20 in Scripture signifies “expectancy.” There was to always to be the expectancy that the shekel used was appropriate to the standard. 26 ‘But the firstborn of the animals, which should be the Lord’s firstborn, no man shall dedicate; whether it is an ox or sheep, it is the Lord’s. Exodus 13:2 expressly stated that all firstborn belonged to the Lord. Because of this, they could not be used as a vow of offering. They were already His to begin with. A firstborn man could be vowed though because they were redeemed when the Lord took the Levites as His in place of the firstborn. 27 And if it is an unclean animal, then he shall redeem it according to your valuation, and shall add one-fifth to it; or if it is not redeemed, then it shall be sold according to your valuation. The subject of this verse is very hard to pin down. Is it a clean animal with a defect that cannot be presented to the Lord? Is it an unclean animal according to sacrificial laws? Is it even still speaking of the firstborn of animals referred to in verse 26? It has already been prescribed in Exodus 13 that the firstborn of a donkey was to be redeemed with a lamb or have its neck broken. Does that principle apply to all unclean beasts, or only donkeys? Probably, this is speaking of the firstborn of an unclean animal other than a donkey, but being dogmatic here, especially when dogs are unclean animals, is probably the wrong course of action. The price of a dog is forbidden to be brought to the house of the Lord for any vowed offering according to Deuteronomy 23:18. 28 ‘Nevertheless no devoted offering that a man may devote to the Lord of all that he has, both man and beast, or the field of his possession, shall be sold or redeemed; every devoted offering is most holy to the Lord. A new word, with an awesome and terrifying meaning, is introduced into Scripture here, kherem. The word is also translated as a net. The idea is that as a net closes and drags away its catch, so it is to be with something devoted to the Lord. Kherem signifies something placed under a ban and devoted to destruction. 29 No person under the ban, who may become doomed to destruction among men, shall be redeemed, but shall surely be put to death. Though scholars attempt to separate the words of verse 29 from verse 28, it is hard to see how they can justify this. Verse 28 explicitly gives a person the power to declare a man under his possession kherem. Verse 29 immediately follows and says that all kherem who are devoted as kherem shall be put to death. As melancholy as the passage is, this verse seems to explain the intent of the account of Jephthah’s daughter in Judges 11, and it shows the severity of speaking rashly. Though that was a vow and not a kherem, the result was the same as if it was. Further, it shows the disobedience of Saul who made a similar vow in 1 Samuel 14 which his son was implicated in, and which he did not carry out. Everything which came from the agricultural work of the people was to have a tithe, or a tenth portion of it, removed. This was to be considered “holy to the Lord.” At this point, what that means is not explained, but that is coming later in the law. For now, one tenth of the land’s produce was considered as holy. The tithes were excluded from vows because they already belonged to the Lord, but they could be redeemed by adding a fifth of the value to them. What this means is explained in more detail later, but for now, the animals would pass under a rod. As each passed, it would be counted. Each tenth would be set aside as qodesh l’Yehovah, or holy to the Lord. That animal could not be sold or kept for working or for anything else. It was set apart to the Lord. When the tenth animal passed under the rod, its fate was sealed. It was not to be exchanged for a better or worse animal. If an exchange was attempted, then both were to be considered holy. 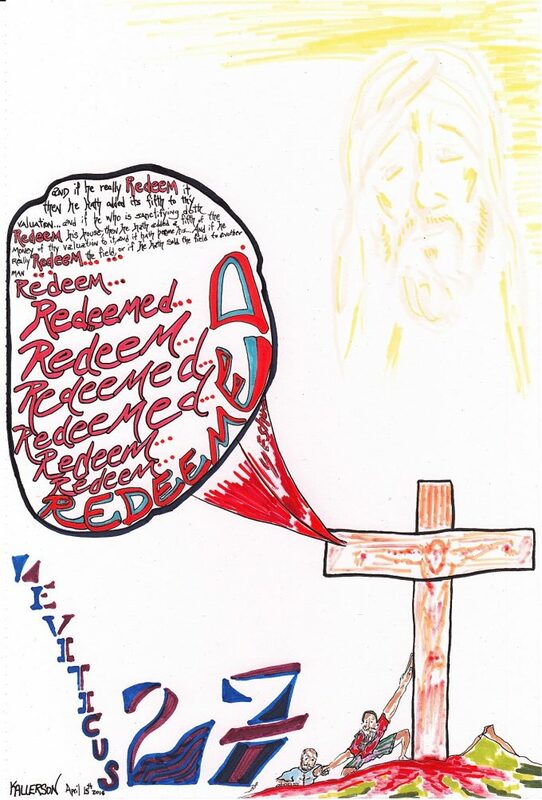 What can be inferred from the words, “It shall not be redeemed,” is that they could neither be bought nor sold. They were set to be dedicated to the Lord, and that was their purpose henceforth. As an additional note: The tithe will continue to be explained and defined after this point, and throughout the law. Some scholars will point to those clarifications as being “second” and even “third” tithes. There is no such thing. The subject of tithing is one of the most misunderstood, and most abused principles in the church. The tithe, or tenth, is a precept found in the law, and it is never repeated under the New Covenant. Further, what is done with the tithes, even under the Mosaic Covenant, is wholly ignored by preachers. This precept, now named here, is the first time that tithing is mandated under the law. Two other times, the setting aside of tenths are mentioned before this. Both are in descriptive passages, and they mandate nothing. Some, however, will point to those two passages and claim that because they precede the law, the tithe is an eternal standard for man. They claim that it falls under the “law of first mention,” meaning that something mentioned for the first time is to be upheld after that. There is no such law in Scripture. If there were, anyone could have multiple wives and concubines, we would have to marry our oldest daughters off before our younger ones could marry, and if our son died, we would be giving his widow to our next son to raise up children in the first son’s name, we would be paying dowry’s for our wives, giving our firstborn a double portion of the inheritance, observing the weekly Sabbath, and the seventh-year Sabbath. We would also be observing those pilgrim feasts mentioned in Exodus. On and on and on it would go. Understand now that the tithe is not a New Testament principle, and even when preachers teach tithing, they don’t do it according to the standard of the law. Remember this simple rule: No thithing. There is one precept in the New Testament for giving, and that is to give as one may prosper. That is it. Out of that prospering, Paul then says to share in all good things with the one who teaches you. *34 These are the commandments which the Lord commanded Moses for the children of Israel on Mount Sinai. The words here simply and elegantly close out the book of Leviticus. They immediately speak of the contents of this chapter, but they are an overall summary of the entire book. And though this chapter has lacked much of the Christological symbolism that most of the book of Leviticus has shown us, it is an important ending to the book. Without it, there would have been a void in several important aspects of the lives of the Israelites. What would be the result of making vows? What would have been the consequences for reneging on those made? Who was to be the deciding voice in such things? And so on. It was necessary to put these here, to ensure a smooth transition out of Leviticus. Further, though its placement is often called a mistake, it is more than appropriate. Rather than closing out the general Sinatic laws with blessings and curses, it ended on a more positive note of what could and could not be vowed to the Lord. And finally, things like the tithe are spoken of here, but what to do with them is not revealed. Thus, it gives an anticipatory taste that more is to come before all is complete in regards to such things. In all, the Chapter serves as a marvelous conclusion to the book of Leviticus. The word He uses, Corban, is found in Leviticus 27:9. It is an offering to the Lord. What the people were doing, was getting around the law of tending to their parents by taking what should have been used for their care, and making it a qorban, or offering, to the Lord. By doing this, it meant that it could not be used for any other purpose. And the parents would rather do anything, even perishing, than to interfere with such an offering and rob God. Eventually, the person could reclaim their offering by adding the standard 1/5 to the value. Thus instead of tending to the parents with a great portion of the asset, they would supposedly be honoring God. The 1/5 value would be a minimal loss compared to spending it all on their care. The priests would profit off the deal, and all would be well with the world. But Jesus knew their deceit and laid it out for all to see and understand. The law was intended to bless the people, protect the poor and needy, and glorify God all at the same time. It was never intended to be used as the leaders of Israel did. They manipulated its precepts for gain, and they harmed the people in the process, both in the hardening of the hearts of the people, and in the mistreatment of those who should have been cared for. As we continue through the law, we can see where it constantly failed to do what it was given to do, which is 1) to sanctify the people – “…you shall be holy; for I am holy” (11:44), and 2) to grant them life – “You shall therefore keep My statutes and My judgments, which if a man does, he shall live by them” (18:5). The people failed to be sanctified, and the people died. Leviticus shows us that something more was needed than the law itself. This beautiful, marvelous treasure of 27 chapters was given to lead us to a better understanding that we need Jesus. And so, before we depart today, getting ready for a new adventure in another book of the Bible next week, let me tell you about Jesus, and how He is so very important to your life.